After the Surbo is installed, the air filter is put back. Delivering improved air suction and raised air compression, the Surbo (air suction turbo) brings increased engine torque, resulting in a light feel accelerator action, for brisk cruising and fuel saving. Driven faster, it brings the engine to its rpm limit with just 1/2 throttle! You'll never have to floor the accelerator again! 10% fuel saving on average due to less accelerator pressure required for the same speed. Higher rpm capability, more torque and bhp over wider rpm range. Acceleration time from zero to 100 kph cut by 1 second for faster models and up to 3 seconds for slower models. Higher top speed by up to 30 kph (as reported by customers). Less CO2 output due to less fuel input required for the same rpm. For the automatic version: instant take off from standstill with no torque converter slip due to increased torque, higher revs in D mode between 4500 rpm to red line depending on gearbox, and easy gear kickdown. More..
For the manual version: achieving rpm limit with just 1/2 throttle, and even higher revs if the rpm limit is removed. More..
For the diesel version: no diesel black smoke because the accelerator is pressed only halfway for the engine to reach the rpm red line, and better load capability. 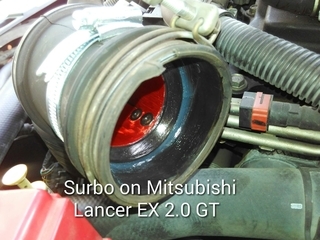 More..
For the turbocharged version: reduced turbo lag, and ability to anticipate the turbo. More..
How can the Surbo be so effective? Due to gaps along the air intake and connected tubes and chambers, possibly due to wear and tear, imperfect design, or third party servicing or modification, air suction is not entirely directed at the air filter. Not only is air velocity through the air filter not as high as it can be, the gaps mean some of that air will not enter the engine for combustion. To create more air suction, the accelerator has to be pressed more, causing more fuel to be injected, resulting in over-fueling that can cause hesitation, and even knocking. The rpm achieved may not be very high. Some fuel is wasted, often in the form of emissions. A shortage of air causes automatic gearboxes to shift up too soon, because in a higher gear, the engine requires less air. This also makes downshifts more difficult, as the engine requires more air for higher rpm in a lower gear. So, often the accelerator has to be pressed deeply to allow more air into the engine to induce a gear shift down. The result is wasted fuel, increased emission and foot fatigue for the driver. 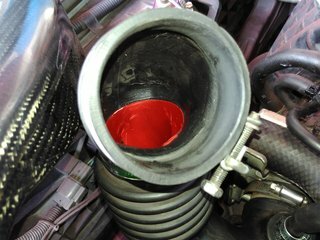 In a petrol engine, when the accelerator is pressed more, the vacuum in the engine manifold drops. However, the vacuum is the only force that draws air into the engine. The moment the accelerator is pressed fully, the vacuum falls to zero, and air induction force is minimized. Also, with the accelerator on the floor, fuel injected is maximized, and over-fueling occurs. Acceleration quickly becomes zero for the gear, and a gearchange up is necessary for further acceleration. Acceleration begins to slow significantly from third gear, and in the top gear, the rpm limit cannot be reached. Therefore, the top speed of a typical 1.6 litre sedan is only about 190kph. The Surbo is designed to help you extract the full performance of your vehicle easily, and with just 1/2 of full accelerator pressure. How can this be done? During installation of the Surbo, the gaps in the air intake and connections are covered. 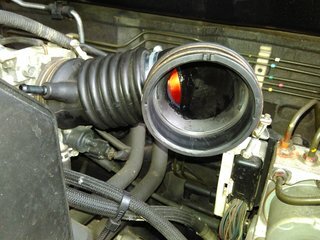 Less accelerator pressure is required to pull the air through the air filter and into the engine. The lesser fuel injected due to less accelerator pressure means over-fueling is prevented. More air goes into engine for proper combustion. So, acceleration becomes faster initially, so much that some of the added momentum and time saved can be used to compress air through the Surbo, for even more power. How so? By slightly easing pressure off the accelerator for 1 second, a backward air pressure is formed towards the outlet of the Surbo, causing it to twist and jet air there to match the back pressure, and the twisting results in a vortex within the Surbo. Upon subsequent acceleration, due to the air pressure that is still ahead, the jetting and vortex continue, and air is gorged into the engine, so that the rpm limit is achieved with just 1/2 accelerator pressure! When the air is charging between the Surbo and the engine, the engine also puts out exhaust gases of increased pressure, thus helping the exhaust system to blast out the burnt gases from a lower rpm (which aids low end torque). For turbocharged engines, since the turbocharger is driven by the exhaust, the response time of the turbo is reduced so the full turbo effect comes earlier and with less effort from the engine. For automatic vehicles, since the Surbo feeds the engine with more air, the engine is allowed to rev higher before changing to a higher gear, and this gives more speed and makes better use of the original max engine torque available at the upper mid rpm range. Similarly, due to more air on standby, downshifts are easier to induce with just a slight press on the accelerator. Once the Surbo is on, a second downshift can also be induced for even more acceleration. Since the accelerator is never floored, manifold vacuum does not fall to zero, but continues to draw air into the engine forcefully together with the jets and vortex, so acceleration is extended till the rpm limit is reached. With this 3-force air induction system, the Surbo-assisted vehicle is so strong that it will reach the rpm limit even in the top gear, and top speeds of 220 kph for 1.6 litre sedans are consistently reported by customers. While not everyone will drive at such a high speed, a higher top speed means that cruising is easier and fuel savings increase. As the accelerator never has to be floored, the manifold absolute pressure is lower than without Surbo, so the cylinders have an easier time compressing less air, and therefore accelerate faster. Fuel pressure (which is proportional to air pressure) will be less, resulting in lower fuel consumption and emissions. There will be less carbon deposits and combustion heat, so your engine is likely to last longer. The sooner you adopt Surbo technology, the better for your vehicle!